“It’s the most wonderful time of the year.” Not yet, I have to say, but we’re close to it. At first let me say to everyone, Happy Thanksgiving! Secondly, enjoy this wonderful day because the next day after it’s Friday and we all know what this means: Black Friday. 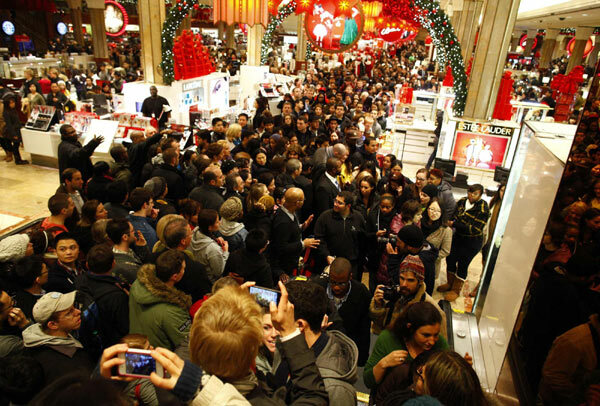 So, don’t eat too much, check your bank account or lend some money, because this year’s Black Friday is the most important shopping day of this year. In case you need some help, we’ll wrap up a superguide so you can find out some of the best deals and the best retailers. So what do you want to buy: a laptop, a tablet, a phone? May a console or a TV? Let’s see. 1) Amazon, the biggest online retailer it’s one of the best place to go on Friday: it is no crowded and it’s more comfortable. Amazon comes with some interesting offers: phones, PCs, cameras, GPS, HDTVs, consoles and so on. – Samsung Galaxy S II will be priced at $560 and you can save up to $340 by buying it. – Samsung 3D UN55C7000 55-Inch model has one of biggest price cut I’ve seen on Amazon: $1,575. So you will be able to purchase the Samsung UN55C7000 TV for $1,725. – Toshiba Satellite R845-S85 has a $250 price cut and will cost $599 this Friday. 3) Walmart comes with some great offers too, but I suggest you to go and check the offers for your region because the items might be available only to some stores. So there you have it, so great offers that can inspire you before going shopping this Friday. There are a lot of other stores, but some of them are changing their offers hourly and you have to be fast to get one: NewEgg, MacMall, Apple, Barnes and Noble, VerizonWireless. That being said, pack yourself with nerves and time and go out this Friday to enjoy some great deals. And remember not to forget your wallet. Happy Shopping everyone!